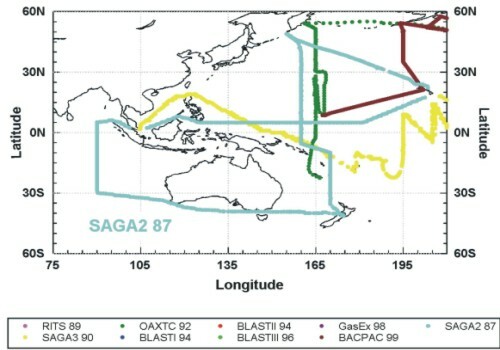 Five trace gases in the surface water and atmosphere of the West Pacific and East Indian Oceans were measured by automated gas chromatography from May through July 1987. The data included more than 1000 measurements each of N2O, F11, and F12 in the surface water and in the atmosphere, and about 2000 measurements each of CH4 and CO2 in the surface water and atmospheric boundary layer of the West Pacific. In addition, over 600 measurements of dissolved N2O were obtained from hydrocasts made along the entire 45000 km cruise track. Data from this cruise are presented here in graphic and tabular form, along with detailed discussions of the methods used in analyzing the samples and reducing the data, and a brief summary of the results and their significance. Also included are results from laboratory tests of the Weiss equilibrator. Data from the equilibrator tests were used to develop a mathematical model of its performance. 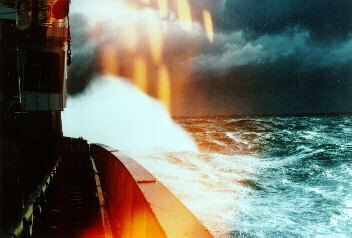 The Akademik Korolev departed Hilo on 1 May 1987, HI to proceed towards the Kuril trench, headed south along 160°E and 170°E meridians and terminated its first leg in Wellington, New Zealand on 9 June 1987. Leg 2 ran south of Australia then north along 90°E to Singapore between 12 June and 6 July. Leg 3 began on 9 July in Singapore and was essentially a transect along 5°N turning up toward Hilo, HI at 180°E where it arrived on 28 July 1987. SAGA II is shown in light blue through the West Pacific and Indian Oceans, out of Hawaii, around Australia, into Singapore and back to Hawaii. Trace Gases in and Over the West Pacific and East Indian Oceans During the El Niño-Southern Oscillation Event of 1987, J.H. Butler, J.W. Elkins, C.M. Brunsen, K.B. Egan, T.M. Thompson, T.J. Convay, and B.D. Hall, NOAA Data Report ERL ARL-16, available from James Butler or through NTIS, 5285 Port Royal Road, Springfield, VA 22161 (1988). Data is available on our anonymous FTP account ftp.cmdl.noaa.gov, subdir /hats/saga_ii.